In this lyrical meditation on listening, Jean-Luc Nancy examines sound in relation to the human body. How is listening different from hearing? What does listening entail? How does what is heard differ from what is seen? Can philosophy even address listening, ecouter, as opposed to entendre, which means both hearing and understanding? Unlike the visual arts, sound produces effects that persist long after it has stopped. The body, Nancy says, is itself like an echo chamber, responding to music by inner vibrations as well as outer attentiveness. Since "the ear has no eyelid" (Quignard), sound cannot be blocked out or ignored: our whole being is involved in listening, just as it is involved in interpreting what it hears. The mystery of music and of its effects on the listener is subtly examined. 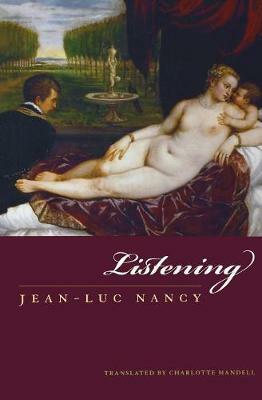 Nancy's skill as a philosopher is to bring the reader companionably along with him as he examines these fresh and vital questions; by the end of the book the reader feels as if listening very carefully to a person talking quietly, close to the ear.